Today we attended a UAL PG Community Pop Up Common Room Event at the Wellcome Collection, to have a special tour of Can Graphic Design Save Your Life? 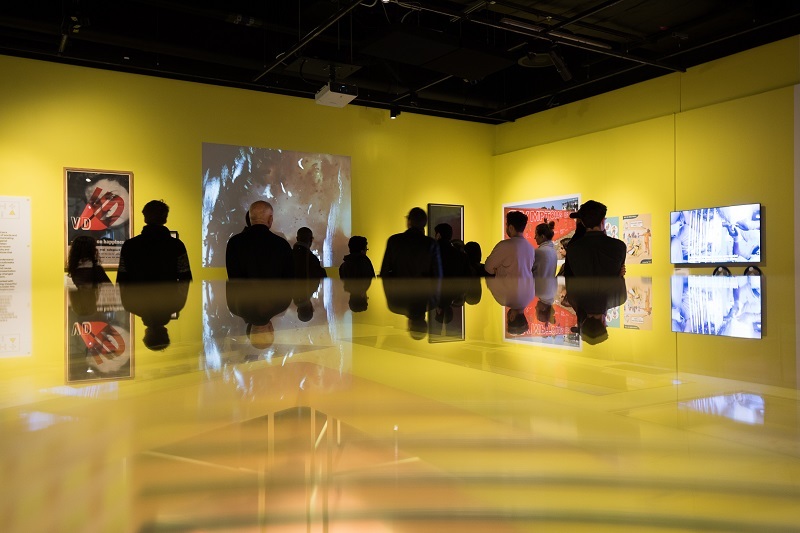 Exhibition, given by one of the curators Rebecca Wright, who is also the Programme Director and Course Leader of MA Communication Design at Central Saint Martins, and partner in the design practice GraphicDesign& . 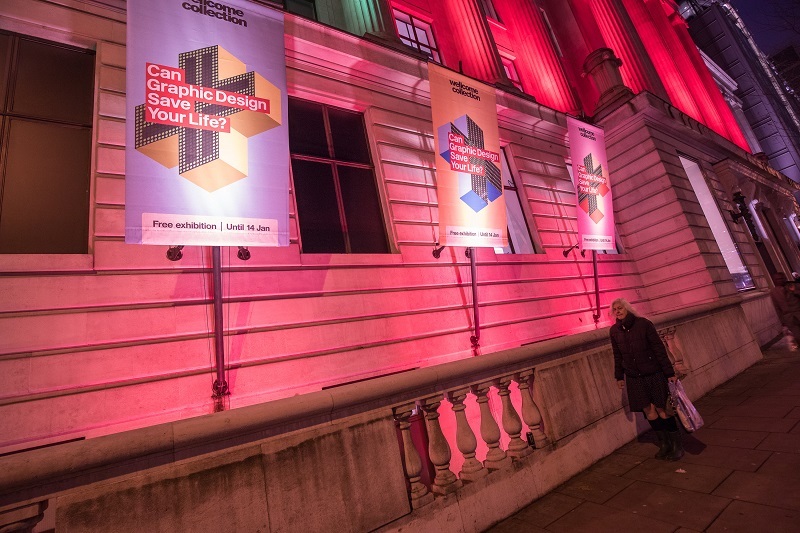 The show charts the influence of graphic design on delivering messages, and given its venue, particularly around health, and was cleverly designed into 6 sections, the shape of which was reflected on plan. (More later on this.) What was very clear was the visual joy of graphic design to a non-design audience. 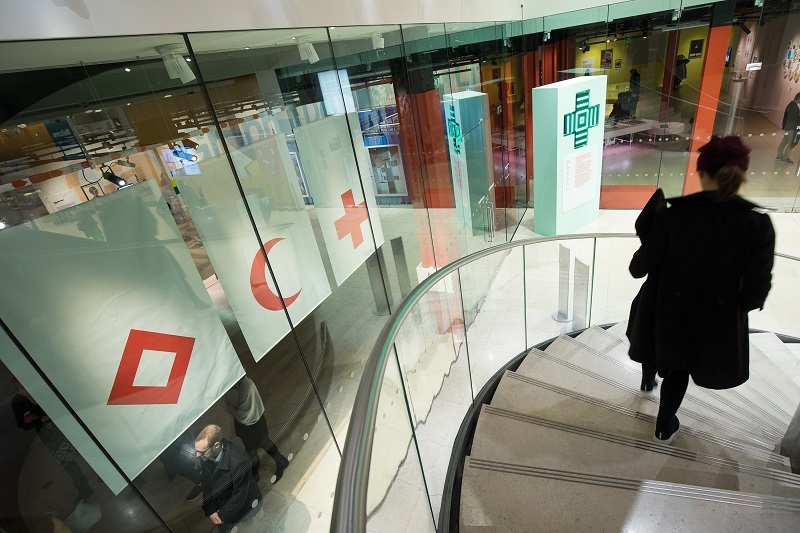 The show opens perhaps the most recognisable image of graphic design, the Red Cross, an inversion of the Swiss Flag, a protected symbol to guard medical facilities in field of war. The 5 themes start with Persuasion, laid out in the shape of a cigarette, if viewed from above, showing us that the graphic design of Loewy’s Lucky Strike packet, is designed to become part of the smoker’s cool new identity and Silk Cut, the 1980’s Saatchi and Saatchi’s slit purple and white silk, appealing to the cognoscenti. The show goes on to show us graphic designs long and conflicted relationship with cigarettes, with much anti-smoking design including the fabulous Biman Mullick’s CLEANAIR posters and the American Cancer Society’s tobacco map. (http://www.tobaccoatlas.org/topic/cigarette-use-globally/). 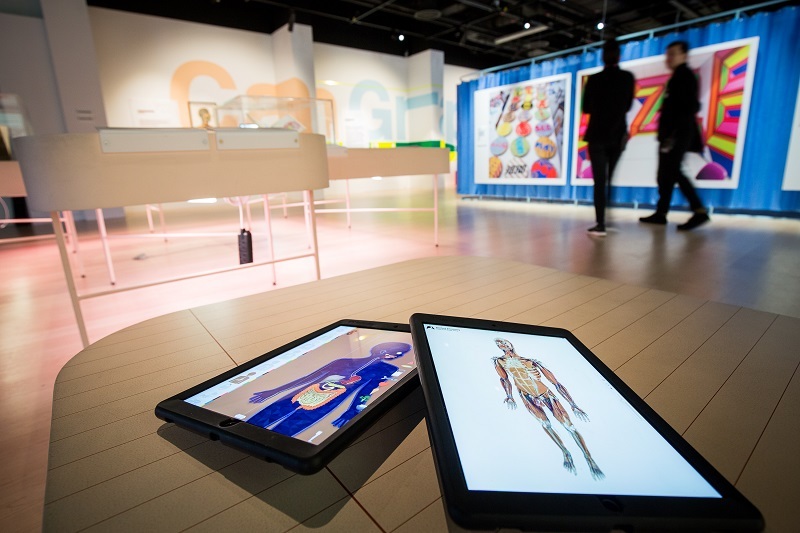 The second area was Education, in the shape of question mark, explaining that graphic design still primary medium for information about the body and showing us colouring books for learning anatomy (Wynn Kapit 1977, still used today by medical students) and 1950s cartoon books on family planning (married couples only) as well as Fritz Kahn influential design of body as machine. 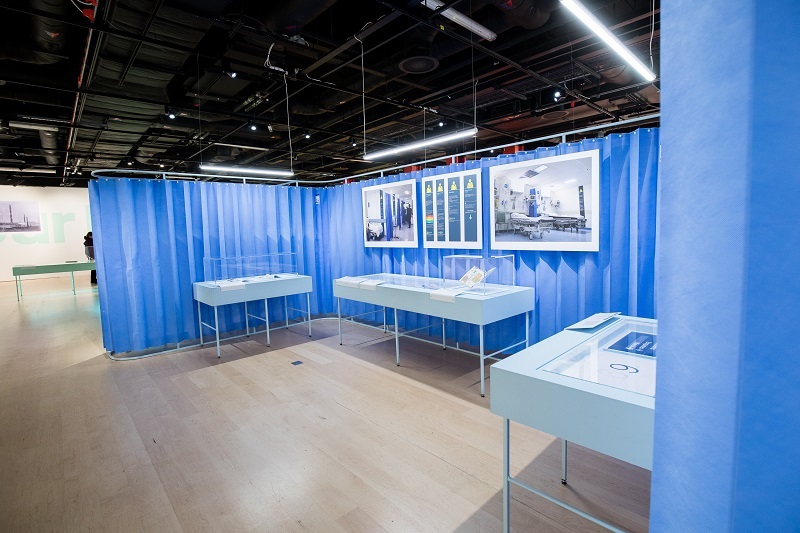 Hospitalisation was next, with H in blue hospital dividing curtains.Department of Health commissioned designers Pearson Lloyd to improve violence in hospital. After research, it was realised that people didn’t have enough information about what they were going through. Signage changes were made, many very simple like numbering cubicles and a live waiting board in the hospitals, explaining the treatment procedure beautifully clearly. The result was piloted in two hospitals for a year and incredibly, the incidence of violence fell by half. (http://pearsonlloyd.com/healthcare/) There were also gorgeous and clear ‘point to the problem area’ communication cards, if you don’t speak English, and ways of describing pain which is not visible. (Feeling of Pain LCC’s own Yin Yao https://www.artsthread.com/blog/london-college-communication-ma-graphic-design-2012/ ). Medication showed us Henry Wellcome’s first ever tablet (Digoxin), from the 1880s, the first time a dose was accurately dispensed and measured, as well BAUER trademark design in the shape of a pill. Contagion next, in shape of a warning triangle and here graphic design is used to warn and inform directly and simply, like using pictures for Zika and Ebola. 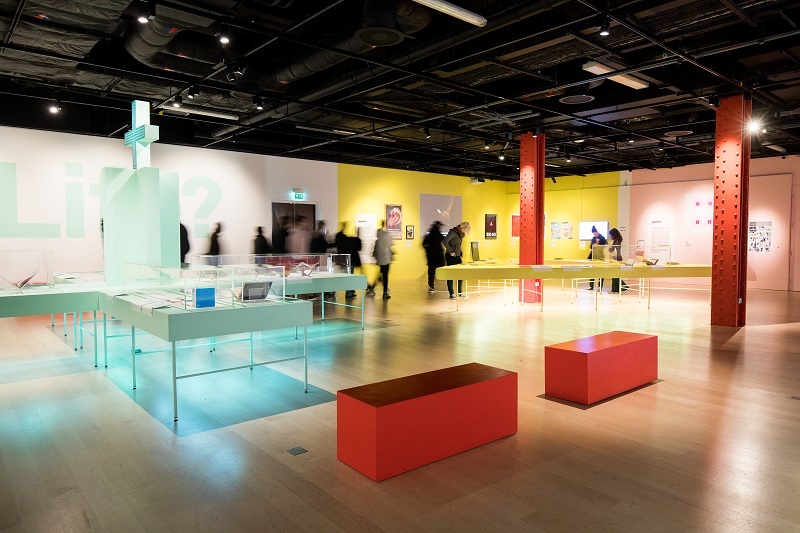 But the exhibition also shows us the role that graphic design plays at times of infectious disease to influence behaviour by visualising information. There are John Snow 1855 Cholera map of Soho (showing where people died and the locations of water pumps) and Florence Nightingale’s Mortality Charts from Crimea War showing infection spread. John Hurt’s voice boomed out in a 1980’s Malcolm Gaskin and Norman Fowlers’ AIDS campaign, Don’t Die Of Ignorance, referencing Spinal Tap to get the message across. Last was Provocation, in the shape of an exclamation mark and some self-reflective beauties were First Things First, Ken Garland’s outcry against mass consumerism and how designers support it through advertising (http://www.designishistory.com/1960/first-things-first/ ) and a design showing Alzheimer’s progress, with a deeply moving dissolving typeface by the Dutch studio Dunbar. Commerciality is ever present however, and success of the design work is vital to the success of the institution. Empirical evidence is demonstrated in Macmillan Cancer semi-handwritten leaflets which led to a 26m growth in fundraising, and Save A Life organ donation campaign, raised donations by over 200%. 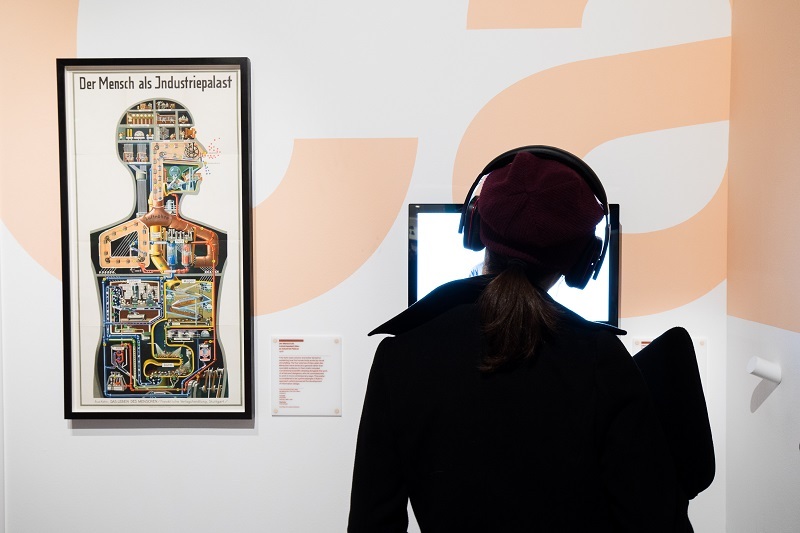 This is a show, three years in the making, curated by graphic designers, and it shows, with nearly a hundred thousand visitors. Inasmuch as clear design feels effortless and natural, so did the show. In answer to the question, Can Graphic Design Save Your Life?, the answer is an obvious yes. As with all things effective, they easily become invisible and assimilated. This exhibition sets out to show us how and why. Exclusive to UAL’s Postgraduate Community, Pop Up Common Room events assist in the community’s aims for building platforms for skill sharing, networking, collaboration and investigating new communities of practice. These events can take the form of talks with industry specialists and guests, visits to artist studios and industry spaces, networking with other postgraduate students from other Colleges, students sharing outcomes of recent commissions and workshops /skill shares. Visit our Previous Pop Up Event Archive to find out more about past events. Pop Up Common Rooms are advertised on the UAL Events page and in the weekly Postgraduate Community newsletter which is sent out on Friday’s to all current student UAL email addresses. We always welcome applications from students and those in the industry to host Pop Up Common Room events, if you are interested to learn more about hosting please get in touch via email PGCommunity@arts.ac.uk.